The Partnership for a Healthy Mississippi (PHMS) has awarded grants of $1,000 each to seven JPS schools. The Improving the Culture of Health in Schools Grant provides funds to assist with projects that are designed to create healthier learning environments. Grants may be used for initiatives that address family engagement, community involvement, academic enrichment, chronic absenteeism, health education, and physical activity. 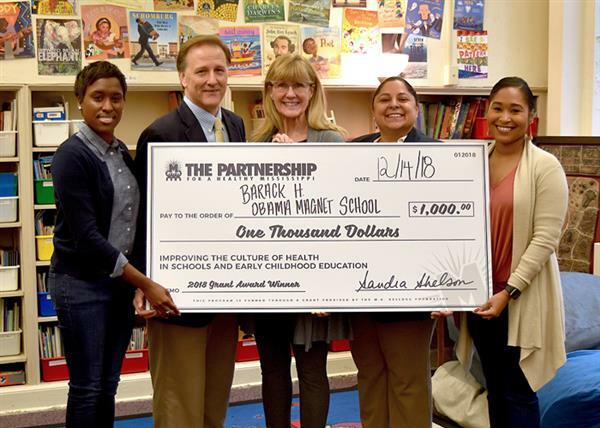 The Partnership for a Healthy Mississippi presents Barack Obama Elementary School with a grant check that will be used for playground equipment. Participants are (from left) D’Angelique Lister, PHMS School Health Coordinator (Jackson); David Schommer, Barack Obama teacher and playground project coordinator; Sandra Shelson, PHMS Executive Director; Dr. Kathleen Grigsby, Barack Obama Principal; and LaCiana McIntyre, PHMS Director of Health and Wellness. One of this year's grant recipients, Barack Obama Elementary, will use the award to help with renovations to the school's playground. A swing set, a basketball goal, and a tetherball pole will be added as part of the overall project. The type of equipment they want to install offers enjoyable and structured play options for students. One of the state's most successful schools, Barack Obama recognizes that healthy bodies and strong minds go hand-in-hand. The project has support from faculty, parents, partners and neighbors of the school. The school's health council has guided this and other health and wellness initiatives with assistance from the Partnership for a Healthy Mississippi. 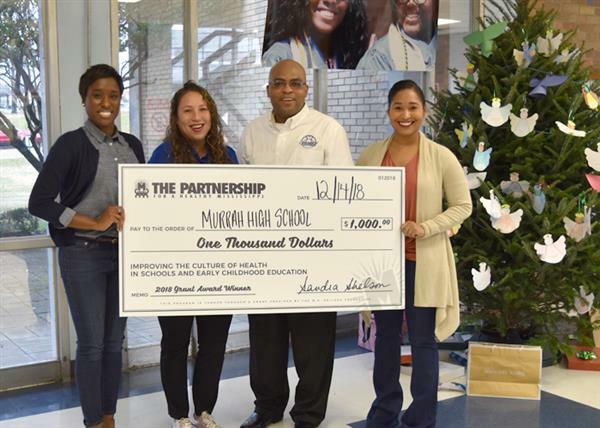 Participating in the check presentation at Hardy are (from left) Dr. Samecia Minter Stokes, Assistant Principal; Demarcion Curtis, student; Dr. Cindy Thomas, Assistant Principal, April Amos, health teacher; Nhoa Moore, student; D'Angelique Lister, PHMS School Health Coordinator, and Vertis Holmes, Principal. In an effort to strengthen community and family engagement, Hardy Academy of Career Exploration is using its $1,000 grant to support initiatives to reduce chronic absenteeism among students. The school's EWS (Early Warning System) team, along with other community supporters, work on key activities that include: Parents Count Day, a reward system for monthly perfect attendance; nine-weeks perfect attendance celebration; and R.O.A.R. (Respect Our Attendance Rules) competition among homeroom classes. Assistant Principal Dr. Samecia Stokes wrote the grant and oversees the success and maintenance of the projects it supports. 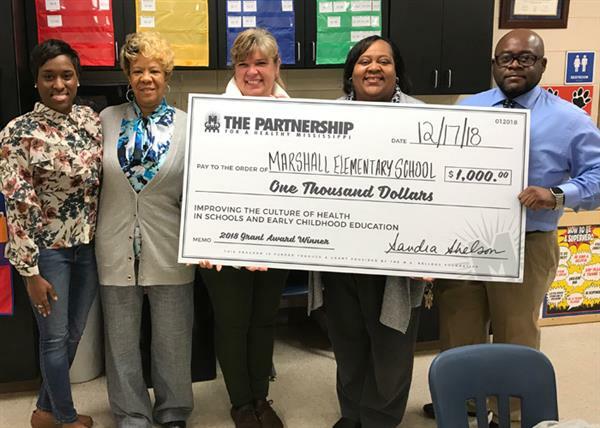 D’Angelique Lister of the Partnership for a Healthy Mississippi (from left) presents a grant award for $1,000 to Marshall Elementary teachers Margaret Jurden and Dawn Barnhill, Principal Helen Young, and Assistant Principal John Johnson. Marshall Elementary will launch "It Pays to be at School." The idea is to reduce tardiness and absences by motivating and encouraging regular school attendance. Students will receive weekly incentives and monthly celebrations for being on time and at school. The program seeks to instill in students the importance of attending school every day and being consistently punctual. Murrah High School will launch a campaign to educate students about a variety of skills that will help them beyond high school. The school will hold monthly seminars and invite guest speakers to interact with the students about life after high school. Topics will include etiquette, self-esteem, proper hygiene, and physical education. Galloway and G.N. Smith Elementary Schools and Siwell Middle School also received Improving the Culture of Health in Schools Grants for projects that will improve the well-being of their students and staff. The Partnership for a Healthy Mississippi got its start in 1994 to increase awareness about the impact of tobacco on Mississippians. The organization's interactive educational and training programs make it a national leader in reducing tobacco prevalence among youth. The organization's mission extends to improving the overall culture of health in Mississippi through programs like the school health grant.